When Wet Hot American Summer premiered over a decade ago, it found a cult audience through its wild premise, which basically followed a slew of camp counselors in their thirties playing teenagers. Now the whole cast is returning for Netflix’s Wet Hot American Summer: First Day at Camp, and executive producer and actor Michael Showalter is happy to explain exactly why it doesn’t matter how old the cast looks. The original movie has slowly turned into a cult classic over the years. When it first premiered, it was far too weird to attract a wide audience. Between the drug use, heavy swearing, talking can and general weirdness, it went right over most people’s heads. To weirdo comedy fans, however, something about it just clicked. The outrageous comedy has been slowly passed around in the years since, and now, the cast, despite producing some of the most famous actors in the world, has come back together for a prequel. That wouldn’t make sense for other movies, but as Michael Showalter said, Wet Hot American Summer is all about coming along for the ride. Plus, apparently some of the actors haven’t really aged in more than a decade, so the whole aging thing should be even less of a big deal. 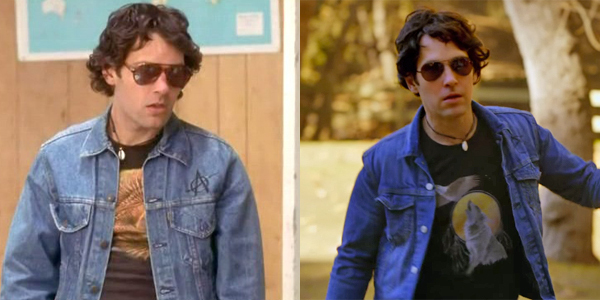 A few days ago, Bradley Cooper talked about how Paul Rudd hasn’t aged a day since the first Wet Hot American Summer was made, and we have the photo evidence to prove it. We’ll go ahead and let you know the new image is on the right, but without that knowledge, it’s really difficult to tell by Rudd’s features alone which picture is older (although graininess is another thing). That’s almost spooky, and it deserves some kind of praise for Paul Rudd and his parents genes that have made that magic happen. In all honesty though, the rest of the cast looks pretty damn good too, starting with Bradley Cooper who could still pass for late 20s in the right role, or in this case, sixteen. If you'd like to learn more about what's coming up with the episodes, you can catch the full interview over at TV Line. Wet Hot American Summer premieres on Netflix on Friday, July 31 at 12:01 p.m. In addition, you can check out the other upcoming Netflix premiere dates with our handy premiere schedule.